The October Draconids, in the past also unofficially known as the Giacobinids, are a meteor shower whose parent body is the periodic comet 21P/Giacobini-Zinner. A Draconid meteor shower is expected to happen in early October of 2011, and the best nights for viewing are expected to be October 8–10. The Draconids are best viewed after sunset in an area with a clear dark sky. They are swift and short in length. 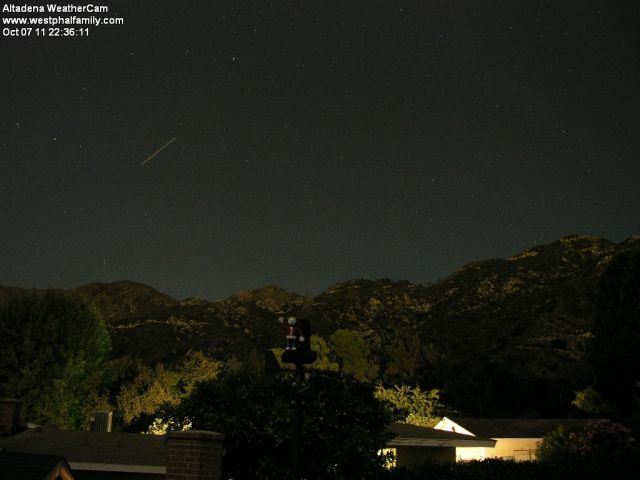 The Altadena WeatherCam caught this one the evening before the expected peak.